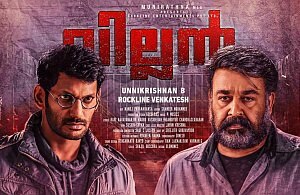 Towards the end of Villain, a heated dialogue between its lead characters Mathew Manjooran (Mohanlal) and Sakthivel (Vishal) rages on. The five-minute scene touches upon dictatorship, vigilantism, taking law into one’s own hards, injustice, hate and love. The narrative of director B Unnikrishnan’s latest investigative thriller is sort of like the dialogue – it tries too many things, ultimately leaving the viewer disconnected.